Yesterday was Malcolm Jones Birthday! Yesterday Was Malcolm Jones Birthday, Please Join Me in Wishing Him Happy Birthday and in Having Many More to Come! Malcolm is an incredible artist and is an Imperial Beach treasure. He is the designer and creator of the Imperial Beach Icon and well known Symbol, Surf Henge. Malcolm has been involved in many artistic projects in the Community and most recently the new Parks at both Seacoast and Date, and the newest one at 10th and Iris. 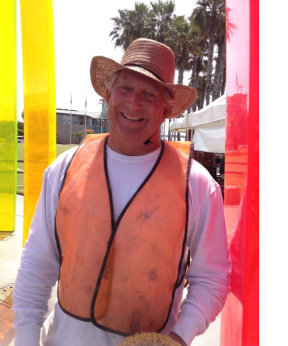 He is a valued member of the Imperial Beach Arts Bureau and is a consistent contributor and creative idea generator of ideas for the Community. Please help me wish him a wonderful Birthday with many more to come! Thank you Malcolm for being an inspiration to us all!